. 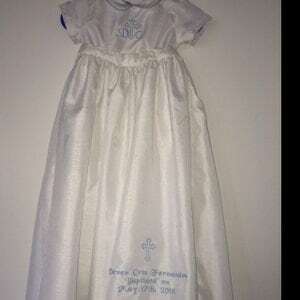 Testimonials | Handmade Christening Outfits | Girls Baptism Dresses – First Blessings Christening and Baptism Wear. Me and my son's godmother totally fell in love with the sailor outfit and placed our order with 2 weeks away from his baptism. After realizing Mandy was in another country my happiness was gone and came back right away after reviewing on mandys extra care and attention. I received an answer back via email with in hours of my first email. Mandy was so kind and wanted me to measure my son so I did . The next day she tells me that the trousers look a Lil long and she was right I took the wrong measurements . Mandy caught it and fixed it . I received tracking information the following day and was able to track the package immediately. Which put my mind at ease. I can't express how touched we were when we received our package we opened it and just dropped our jaws.Mandy you are so talented and skilful thank you for the time and care. Mandy did an excellent job on my sons custom made sailor suite! We used the suite in my wedding which was an outdoor nautical themed wedding. Mandy was very profession and took my ideas into consideration. The suite shipped super fast! Let's just say my sons outfit was the talk of the wedding! Thank you Mandy for the most beautiful baptism boy's romper/removable gown! Your work along with your attention to detail is exquisite. The outfit came out better than I expected, and it looks amazing on baby Deven!! For any future customers: Mandy is amazing at what she does. You can clearly tell she puts her heart and lots of love into every piece she makes. They are truly keepsakes!!! Although the items in Mandy's Shop look beautiful, I was a bit hesitant to place an order at first due to the fact she's in the UK and I'm in the United States. 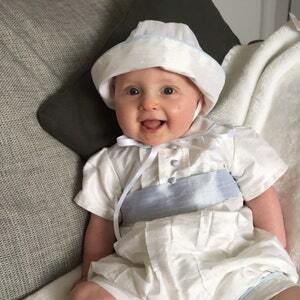 Once I spoke to her, she answered all my questions and offered some helpful suggestions; which put me at ease instantly, and I knew that she was the ideal person to make my son's baptism outfit. The romper was beautifully crafted and exceeded expectations. Mandy was a pleasure to work with and it arrived in plenty of time for my Godson's christening. The Dress was simply beautiful, even better than the picture. It arrived promptly and working with Mandy Green was very pleasant, even taking calls in the middle of the night due to the time zone. Everyone was simply amazed with dress.